“The Hangover,” distributed by Warner Bros. Pictures. I once fell off an 80-foot cliff and lay at the bottom until the EMS unit craned me out. I had a broken wrist, my head was gashed open, and my lower back was in an extreme amount of pain. I had to take a daily regiment of Hydrocodone and still could only make it through half the day. At another low point, I was in a car accident and struck the windshield so hard that it broke my jaw and my collarbone. They had to wire my jaw and 8 weeks later removed the wires from my mouth. It felt like razor blades slicing through my gums. As a sophomore in high school, I was the starting second baseman and made an error to lose a game. I felt like such a loser that my head was in my hands the entire bus ride home. I ended up losing my starting position. As a caddy, I even dropped a golf ball during a professional event and cost my player two shots during the tournament! These four instances surfaced as either physical or mental pain. However, no physical pain is without mental pain. In all of these, I had messed up, and although the physical pain soon passed, what remained were the beliefs and feelings about myself. The residue of not feeling good enough weighed more heavily than any trophy and that does not build mental toughness. If you have broken a bone or failed, then you understand how bad it hurt at the moment. Now, time does not heal completely. Pain leaves scars. But, we have a choice in how we move forward; we can choose either the pain of discipline or the pain of regret. Hold onto that pain until it builds mental toughness. Yes, we must move on, but try to never forget that pain completely. Addicts call this remembering their rock bottom! Mental Toughness means being able to stay in touch with the pain and still not be consumed by it. Pain can help us with our gratitude, because we realize we are no longer in that state. It also assists with our focus and motivation. We are now driven toward another goal and way of being. Click here to subscribe to my Friday Mental Toughness newsletter..
Dr. 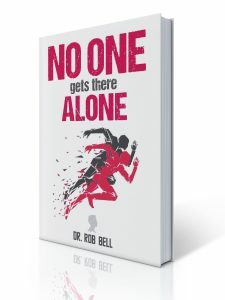 Rob Bell is a Sport psychology coach based in Indianapolis. He works with Indy Eleven Soccer and University of Notre Dame. He has five books on mental Toughness. Check out how to build mental toughness. Did I WIN this medal? What confidence does NOT do!